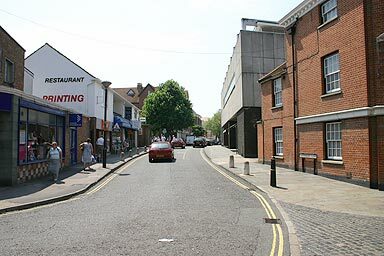 Canterbury Lane was flattened in the war and the buildings here are relatively new. The concrete block on the right of this picture is the Church Hall of St. Mary Magdelen, the Catholic church. The trees in the middle distance stand at the end of a zone where disabled drivers can park their cars. There are always cars parked in this one-way street, it's a prime place to find a taxi at this end of the city.